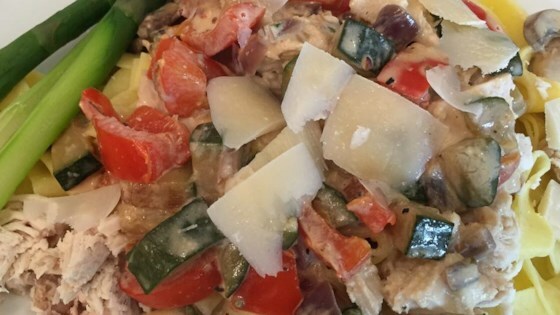 "A delicious pasta and chicken dish with garlic, roasted red peppers, and cream." Melt butter in a large saucepan over low heat; cook and stir garlic until fragrant, about 30 seconds. Pour 3/4 cup chicken broth over garlic mixture; stir in red peppers. Bring to a boil, reduce heat, and simmer until broth is slightly reduced, about 10 minutes. Pour cream into broth mixture; bring to a boil. Simmer, stirring occasionally, until sauce is thick enough to coat the back of a spoon, 5 to 10 minutes. Heat oil in a large skillet over medium heat; cook chicken in the hot oil, occasionally pressing with the back of a slotted spatula, until no longer pink in the center, 4 to 5 minutes per side. An instant-read thermometer inserted into the center should read at least 165 degrees F (74 degrees C). Transfer chicken to a work surface and cover with a piece of aluminum foil; discard fat from skillet. Pour remaining 1/4 cup chicken broth into the same large skillet and bring to a boil while scraping the browned bits of food off of the bottom of the pan with a wooden spoon. Pour broth mixture into cream sauce; stir in basil. Fill a large pot with lightly salted water and bring to a rolling boil. Stir in the fettuccine, bring back to a boil, and cook pasta over medium heat until cooked through but still firm to the bite, 8 to 10 minutes. Drain and transfer pasta to a bowl and toss with 3 to 4 tablespoons cream sauce. Cut each chicken breast into 2 to 3 diagonal slices. Transfer pasta to serving plates; top with chicken and cream sauce. Add a mix of cornstarch and water to thicken the sauce. So yummy! Next time I am going to add a bit of cayenne to give it a bit of spice.